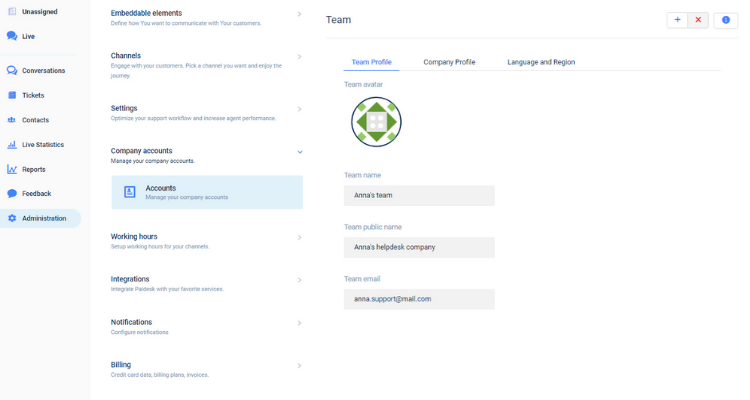 Company Accounts let you to set up your Team Profile with information like Team avatar, Team name, Team public name, and Team email. Also, you can set up Company profile information and your Language and Region. This article will cover how can you manage your Company Accounts. Go to Administration and click on Company Accounts tab. Fill in your Teams Profile and click on Submit button. Fill in your Company Profile and click on Submit button. Select your Language and Region, then click on Submit button. You have successfully updated your Company Accounts!